Life’s a Blur - GeekForce | Experience The Power Of The Geek! Twenty years ago in January 1997 I had seasonal depression, much like 2017. But don’t let that stop you reading because in the midst of all the gloom I found Blur. I’d not been a huge Blur fan throughout the Britpop era. They came to my attention after winning all those Brits awards in 1995 but watching a concert on TV, Showtime, the opening song put me off, Tracy Jacks – it shouldn’t have done, I love that song now. Oasis had been on a wave of glory though and I’d loved all their stuff since Whatever. Like most people of my generation they had loved What’s the Story Morning Glory. What’s the Story had been the soundtrack to 1996. The year previously had been the battle of the bands with singles released by Blur (Country House) and Oasis (Roll with It) on the same day vying for the number one spot. The better single - Country House - got the coveted number one chart position. Blur were first to release their next album The Great Escape, which initially did really well. I remember my brother Gary buying it on CD and we played it a lot over the summer of 1995. Then Oasis released What’s the Story and it had a few great songs which made it the better of the two albums at the time. Blur became almost the joke of Britpop for having an album that was seen as not as good as Oasis. Damon Albarn had to spend 1995 – 1996 listening to people play Oasis whenever he walked by. 1995 – 1996 brought a lot of great Britpop albums – Pulp, Cast, Ocean Colour Scene and the resurrection of Paul Weller. But this was all going to be different in 1997. One thing that I will say is that anyone who listens now to What’s the Story and The Great Escape will re-evaluate The Great Escape. It’s a fantastic album which brings new riches with every listen. Full of melancholy and lush sounds, this was Blur’s last Britpop album in the Life trilogy (along with Modern Life is Rubbish and Parklife). Damon Albarn said that when he heard What’s the Story prior to its release he wasn’t worried about it because he found it a lot of filler. I do agree with this, don’t get me wrong I loved this album just like most people did when it came out. But listening to it now there are five outstanding tracks (Wonderwall, Don’t Look Back in Anger, Some Might Say, Cast No Shadow and Champaign Supernova) and two really good tracks (Roll with It and She’s Electric). Then there is a lot of filler – seven good tracks out of twelve isn’t a great ratio. But we didn’t come here to talk about Britpop. We came here to talk about the beginning of the death of Britpop. Blur started the decline of Britpop in 1997 although we didn’t realise it at the time. 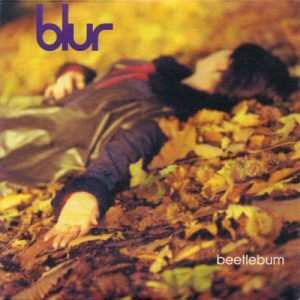 The first release from Blur was the single Beetlebum and my introduction to it was on Top of the Pops (Every Thursday at 7:00pm). It was an exclusive performance, prior to the single coming out, in order to promote it. It was so different from the Britpop Blur. Crunching guitars, weird lyrics that weren’t about Britain. I had no idea what the song was about but I loved it. Beetlebum was released on the 20th January 1997 and went straight to number one, deservedly so. My brother Gary bought the single (parts 1 and 2) and we listened to it non-stop. The B-sides were great as well. Gary learnt how to play Beetlebum on guitar, and when the album came out a whole host of the other songs. The album finally came out on the 10th February 1997. It was completely different to the Britpop Blur of two years ago. Because of the backlash with The Great Escape and tired of teenage girl fans appearing more and more at concerts, the band had become disillusioned with the Britpop movement they had started. Because of Graham Coxon the band had become influenced by the band Pavement and other American groups. They had moved away from The Kinks, The Specials, The Jam and British bands and had in effect, although we didn’t know it at the time, killed Britpop. There were lots of great albums from British artists in 1997 – Radiohead released OK Computer, Mansun with Attack of the Grey Lantern – Britain won the Eurovision Song Contest with Catrina and the Waves and the song Love Shine a Light. Mike Myers even sent up the Cool Britannia image with Austin Powers International Man of Mystery. But those albums of Radiohead, Mansun and Blur were brave new departures showing a new direction. So what was different about Blur? Gone was the orchestration; this was the first stand out, replaced with crunching guitars more akin to Nirvana. The song writing was also different, it wasn’t more mature because Albarn had a maturity of song writing on the last three albums. What was different about the previous albums was that the songs had been about characters and stories about people. Songs like Country House, Stereotypes, Sunday Sunday and Star Shaped were all stories. Albarn did write about himself but had disguised it in such songs as Yuko and Hiro and Blue Jeans. These new songs on Blur were first person and personal to Albarn. Songs about Blur in the music business – M.O.R. and Moving On, a state of mind – Strange News from another Star, his position on America – Look inside America, and his habit – Beetlebum. This was the album of the year for me and we played this non-stop along with the 1997 albums I’ve previously mentioned (a few other albums I should mention which got a lot of play that Summer were Supergrass: In it for the Money, Pavement: Brighten up the Corners and The Prodigy: The Fat of the Land). I can’t tell you how much I love Blur: Blur. It’s an almost perfect album and it should be in everyone’s collection. So what makes it so special? In order to tell you why I will give you a track by track account of the album. The first single release and first song on the album. I think this may have set a trend for the first track on an album being the first single release, every album after this until recently was doing this. Beetlebum is the obvious choice as the opening track and lead single. It is a song that Stephen Thomas Erlewine in Allmusic said ran “through the White Album in the space of 5 minute”. Although I wouldn’t go that far there is a Beatles influence and it must be the first song Albarn wrote that is weird and cryptic, what is a Beetlebum? It was only revealed later that it was a song about taking heroin. But in taking the track apart it starts with Coxon’s muted guitar, then the crunching guitar kicks in and Albarn’s vocal. When the drum and bass finally take hold we are in the mix of something building to a great chorus. The chorus which can be taken on one level about being a woman, but on another there is a drug connotation. The bass is ever changing from following the chords to a something loose and twisting. After two verses and two choruses the song gives into Albarn singing “It’s on it”, with Coxon’s guitar chiming out until the abrupt ending. This was the song that finally gave Blue a hit in America. Supposedly recorded in 15 minutes, forgotten they’d even recorded it and then becoming known as the Woo Hoo song in America. It’s like a punk classic. Blur had experimented with songs similar on the album Modern Life is Rubbish and even Popscene. But this was fast and furious and two minutes of punk. A great second song on the album, completely different to Beetlebum, and making you wonder where the album is going. Alex James said years later that he’d recorded two bass parts on the track but was only aware of this when Stephen Street the producer told him. It just shows some of your best moments are easily forgotten. This song, although a good song, is perhaps my least favourite on the album. The song doesn’t sound like anything Blur have done before or since. It is part story song and I remember at the time of the album coming out Albarn saying that it was about PJ Proby, who’d lived in a caravan at some point when he’d blown all his money. There is a little bit about Damon in it as he’d obviously had some sort of depression after The Great Escape. The interview that I read at the time of the album’s release said that Proby was also having a comeback album at the same time. The next song was also the fourth and final single release from the album. A song about the music industry (the title is a reference to middle of the road music). It does reference “fall out of fashion, fall in again” which is exactly what happened to Blur. Apart from the lyrics, the main thrust of the song is Coxon’s screeching guitars and Rowntree’s driving drums. Listen closely and there is a great bass line by Alex James throughout the song. This was the third single release from the album and a great choice. It probably is one of the best songs on the album. Damon Albarn cites it as his first Gorillaz style song. It’s got some weird Graham Coxon guitar effects throughout. What the song is about I don’t know. The lyrics are great though and we’ll all be the same in the end. This could almost be to a 60s or 70s TV show. This carried on the Blur tradition of having a song that is just instrumental. Although Damon does have some form of distorted vocal. The final speech, that can be heard as the song fades, is from a doorman in America that they recorded as they entered a club. The first Graham Coxon song to appear on an album. The song sounds like it’s being played on an old record player. Slightly distorted – but Graham wanted it like this to hide his vocal. Coxon said at the time that it was an alcoholic state of mind and the thing that could be so great is anything – a bottle of scotch, his mum, or a radiator. It’s a great track and leads the way to his first solo albums. It’s also a song that could have never fitted on any other previous Blur album. It is so different to their other songs yet fits perfectly on Blur. Another song which fits perfectly on this album but was demoed in 1992. They had released the demo version to the fan club in the previous years. 1992 had been a year of change for Blur, with the release of their first album the previous year, they needed to have a worthy follow up. The first album had been a mismatch of baggy, Madchester, indie and shoe-gazing. There were however two stand out tracks – There’s No Other Way – which was cited by Kurt Cobain as a favourite – and Sing. 1992 saw Albarn and the band become one of the forerunners in the Britpop movement, and the rest is history. Sing made a comeback in 1996 on the soundtrack of Trainspotting. Damon said when Blur came out he wondered how their music would have developed if they hadn’t gone down the Britpop road following the first album. I think the whole of the Blur album is a worthy successor to Sing, a truly great song, and I think Death of a Party, born from the same period as Sing, shows that Blur were finally ready to produce that different sound. The shortest song on the album at 1 minute 24 seconds. Its thrashy punk guitars and the lyrics Albarn got from the subtitles on a Chinese film. A great song that is gone before it starts. This was the last song to be recorded for the album and showed the way towards their later albums of 13 and Think Tank. The song is swampy with loops and scratching records, there’s something a bit Gorillaz about it. An excellent track with a distorted vocal from Albarn. Nowadays this verse means less because nobody watches videos. But what a great line going from watching videos all night to rewinding the video of Annie Hall. It’s modern day poetry. One of my friends said once that Damon Albarn’s got the evil gene and these lyrics sum that statement up for me. Along with Look inside America this is my favourite song on album. Almost Bowie like in weirdness and that it’s about Stars. The Death Star actually refers to Damon Albarn’s depression after the Great Escape. The strange news from another star is Iceland ( the country, not the frozen food store) and how Albarn found peace there after all the Britpop hysteria. A place I’ve always wanted to visit since hearing Albarn talk about his love of the country around the time of this album. The song is beautifully strange and unlike any ballad Blur had recorded, with a great guitar from Graham Coxon. A rocking song to end on – distorted vocals, crunching guitars and great drum and bass. It’s just a rocker with Albarn singing about the music moving on – which is exactly what this album did. This is the strangest song on the Album. The guitars sound like a car revving up. The lyrics are from a poem that Albarn had written and performed the previous year. It was a about a real life experience, slightly altered: he hadn’t been beaten up by squaddies but by people who were going to be squaddies. It’s a bizarre ending to an album that is full on in sound - it’s loose, crunchy and intelligent. It keeps you guessing on what will be next and even ends with a secret track of music “Interlude”. Blur’s albums 13 and Think Tank came after this and I loved them but Blur’s Blur was one on its own. After twenty years of listening to it I never get bored of it and always hear new things in it. A great underrated album full of sound and fury and heralding the death of Britpop.